Welcome to the February DeNami Design Blog Hop! This month's hop is all about POLKA DOTS!! Don't forget, there are some super-fun DeNami prizes to be won! Two lucky commenters will be drawn at random from among the comments left along the blog hop to win a $20 DeNami Design gift certificate! You have until Monday, February 10, 2014, 11:59 pm PST, to leave comments on all the blogs to be eligible for a prize. 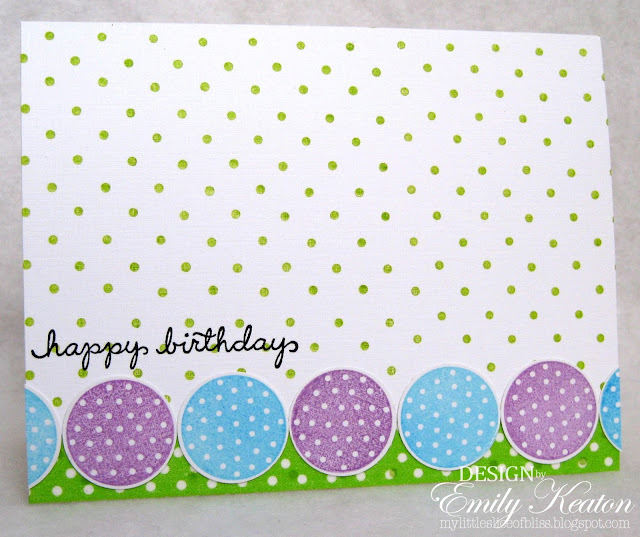 I used a few fun dotty products from DeNami Design: Polka Dot Circle stamp, Polka Dot Background stamp, Happy Birthday Script stamp, and Lime/White Dots washi tape. I also used white cardstock and Onyx Black Versafine ink from the DeNami store. To make my design, I simply stamped the Polka Dot circle on white cardstock in several fresh colors then punched out each circle with a 1" circle punch. I adhered dotted lime washi tape along the bottom edge of the card base and lined up the punched circles along the top edge of the washi tape. It was so quick to make! It's time for me to send you along on your way. But before you leave for more DeNami polka dot inspiration, be sure to leave a comment to be eligible for the randomly drawn prizes. Then you can head out to see the next blog hop participant on today's list: Linda Carpenter. I love, love, love polka dots. This is so sweet and colorful. It reminds me of an Easter card. My embossing folder came yesterday along with the darling card. Thank you so much. Very fun and creative design, Emily!! It is happy, colorful and perfect for a birthday. Ooh, love those polka dots and the pretty colors on your circles. This is certainly a delightful card. Love it! Emily, I love all of your polka dots, especially that circle polka dot. Love your color choices too! Lots of dots! Very colorful and cheery! I love the polka dots, such a cute card! So fun and colorful! It makes me think if Easter eggs! I love that you have white/green dot up top (with your sentiment) and then the negative of that at the bottom green/white dot. Those circles separating the two are just perfect. Very nice. Absolutely darling card, Emily! Purple and blue polka-dots make me smile! WOW! Now that is a lot of polka dots! You balanced them out perfectly with your fun colors! What a cute and simple card. Love the polka dots. Love all the colors, and of course the polka dots!! how precious, Emily! polka dots everywhere...i love it! how cute is this card? great way to start my tour of polka dots! This is a happy card Emily and it just makes me smile!! Very cute, Emily! This could be used perfectly for Birthdays, Thank You's, and just Hello Cards. Darling card Emily! Love the pretty spring colors, and of course, all those polka dots! very fun with all the polka dots--love the colors too. This is a great start to the blog hop - polka dot heaven! Cute, cute, cute! Love your darling card, Emily! Love the dots - darling card. Love your color combo. Fun card! How fun!! It's polka dot to the max and totally adorable. Even would work for a guy friendly card by changing up the colors. Love your polka dots Emily! The colours are so fresh and pretty. Love all you bright cheery colors and dots. Funny how we chose the same stamp!!! HA! I LOVE how you used the Polka Dot Circle here! SO CUTE!!!! This card has such a happy feel to it. I LOVE it..
What fun polka dots! The colors are GREAT!